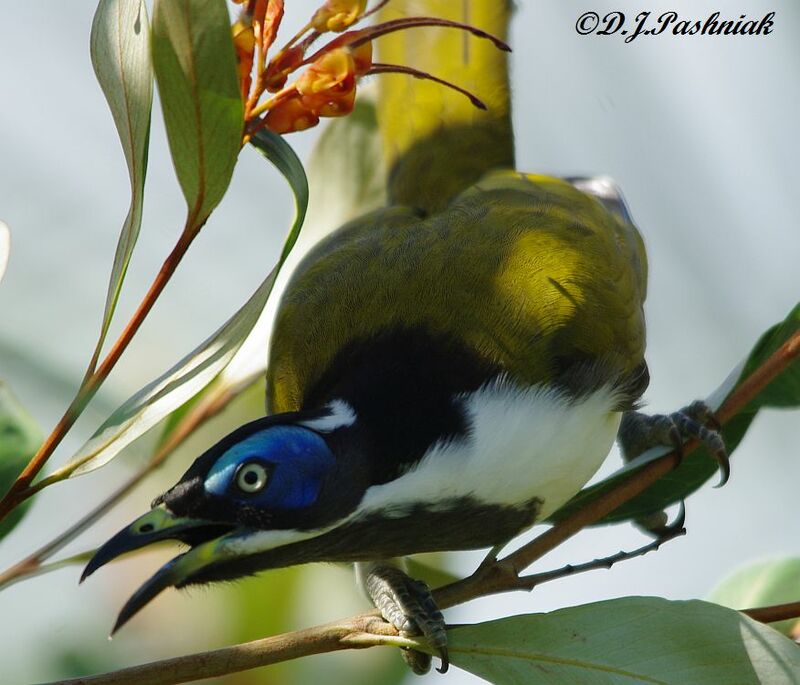 I thought it was amusing when I watched a young Blue-faced Honeyeater try to chase a young Butcherbird out of territory that it claimed. (See post of January 18.) 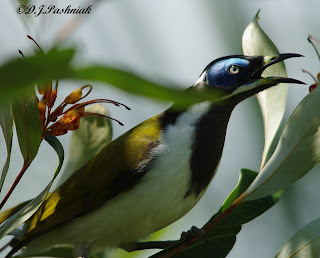 However, the same family of Blue-faced Honeyeaters are now warning me that part of the garden belongs to them! When I walk down that way one or the other of them immediately starts scolding and pretty soon there are a number of them sitting in different trees and shrubs and all telling me to get out of their territory. This is an adult bird showing the blue color that gives it its name. As I said before, these birds are noisy and aggressive! "Scolding" is just the right word for some bird sounds. Are these related to bee-eaters? 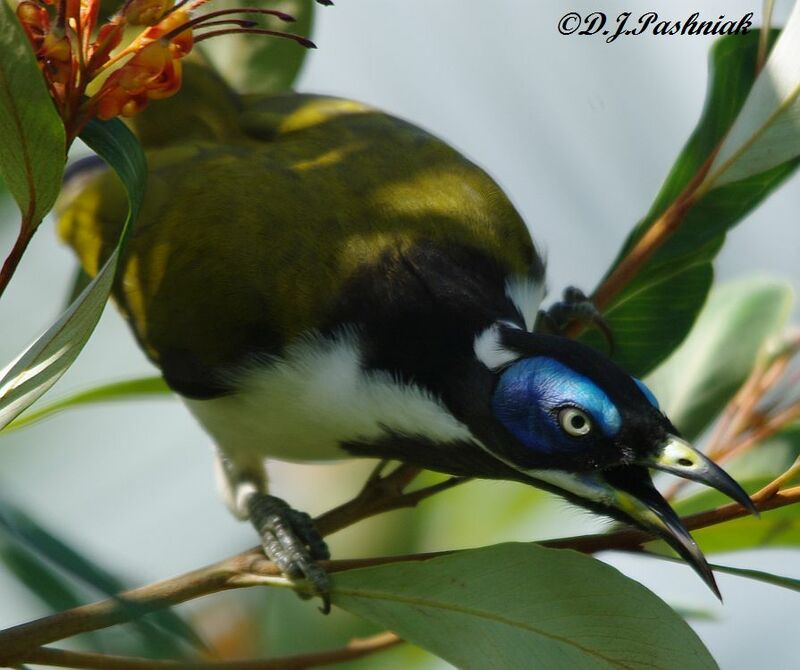 Great photos of an absolutely beautiful bird. Boom & Gary of the Vermilon River, Canada. Thanks for commenting. I don't think they are related to Bee-eaters at all. Wow what a lovely bird to see Mick. Great images and now I know really must buy that World Bird book. Super shots of the aggressive Honeyeater. Some birds can be very aggresive about defending their territory. I have decided to make the bird box unabailable to the swallows this year, they won't let me harvest the apricots in the nearby tree. The bluebirds can still use it. They are more agreeable and have fledged before the fruit is ripe. Aggressive maybe, but they absolutely stunning! Beautiful shots! What Beauties!! Im sure its fun to watch them as they try to chase you away! Excellent captures, Mick. That blue cheek is very pronounced. Nothing like an aggressive bird to keep your on your toes while walking nearby! These birds really can create a lot of noise! How dare you trespass in the territory of such a lovely bird. lol. Nice shots of a beautiful bird! Oh my, this is a beautiful bird, but I bet they do get noisey.Super pictures Mick! These are great captures of this very beautiful bird! Noisy, aggressive and beautiful! Excellent captures! They may be noisy and aggressive, but I'd love to see one...it would be a new one for me (haven't even heard of it). Now I have to go back and see where you are! Lovely pictures. Wow- that thing actually does look sort of fierce. Very cool! whoa - what a cool cool bird! He's really beautiful, love the photos! Tremendous shots Mick. I can't believe they are so aggressive to a human, but maybe why they are so successful? Great shots Mick! Those Blue-facxed Honeyeaters sure are beautiful birds. Are they territorial now because it's breeding season or what? Wonderful photos. I'm new to these birds and am quite impressed! maybe you better be careful then. The bill looks very sharp. But I have to say they seem to be goodlooking. What a gorgeous bird! Great moments you captured, wonderful.